Our “Outreach” break out group dreaming about our future ministry. As we prepare for Pentecost, let us commit ourselves to praying for the Holy Spirit to be present in the dreams and visions we have for our congregation. On the day of Pentecost, Peter quoted the Prophet Joel, above, who spoke so beautifully about God’s interactions with us as we co-create our world toward the vision of the kingdom of God. We will celebrate the culmination of this season of discerning God’s vision as a congregation by bestowing our dreams and visions upon our church leadership – on May 20th, Pentecost Sunday. During our April Discernment Gathering, we remembered all that we have learned about ourselves and our neighbors over the last six months. We considered our needs and identity as a diverse and relational family church. We embraced the ways that we connect with our neighbors and the ways we could collaborate in the future to expand the reach of God’s loving and just kingdom. And with a buzz of activity, we broke out into groups to articulate our dreams for our congregation in this unique context. 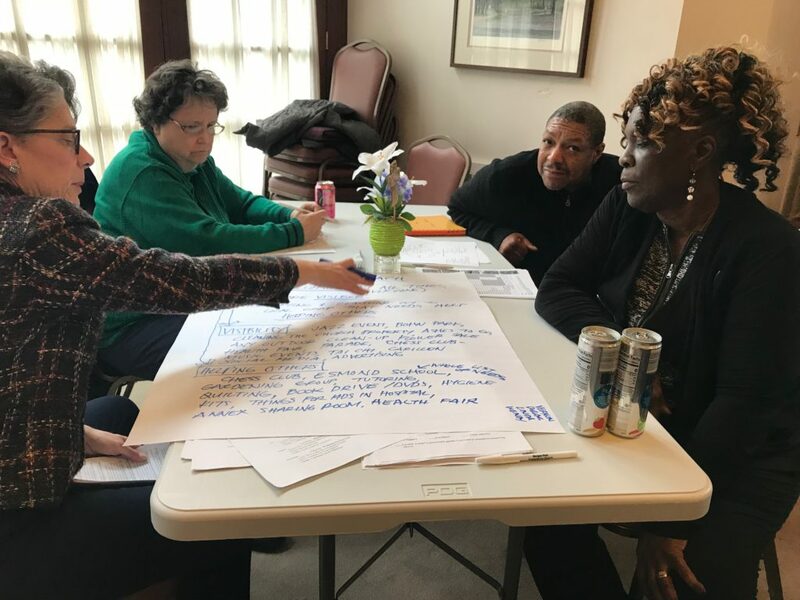 Worship, Outreach, Mission, Christian Education and Congregational Life: These were the themes for the break out groups that emerged from our discernment process. And yet, as the conversations developed, many groups had overlapping dreams that most excited us: The potential to become supporters and mentors for students at Esmond Elementary School; The opportunity to develop a deeper spiritual life with a prayer partner or learning group; Empowering our needs for social connection and respect in our existing ministries. These are just a few of the dreams that bubbled up across our conversations. When we gather on Pentecost Sunday for our final Discernment Gathering in this season, we will take time to prioritize our dreams and visions for our congregation. The goal is not to create a strategic plan or a check list of projects for us to implement, but to give our dreams over to our Session and committee members as a source of direction. As we move into the planting season for our garden, we will also plant these dreams in our minds as we plan for 2019 and beyond. I challenge each of you to stay involved in the process and hold us accountable as we seek to embody your dreams in all that we are. ← How is God calling us to change? Advent: Prepare the way of the Lord – Morgan Park Presbyterian Church on Come, Holy Spirit, Come!